Named for Mary and James Beall, whose gift made the building possible, this hall was dedicated on February 2, 2001. The two-story building is really two buildings in one with rooms available on Side One for females and on Side Two for males. 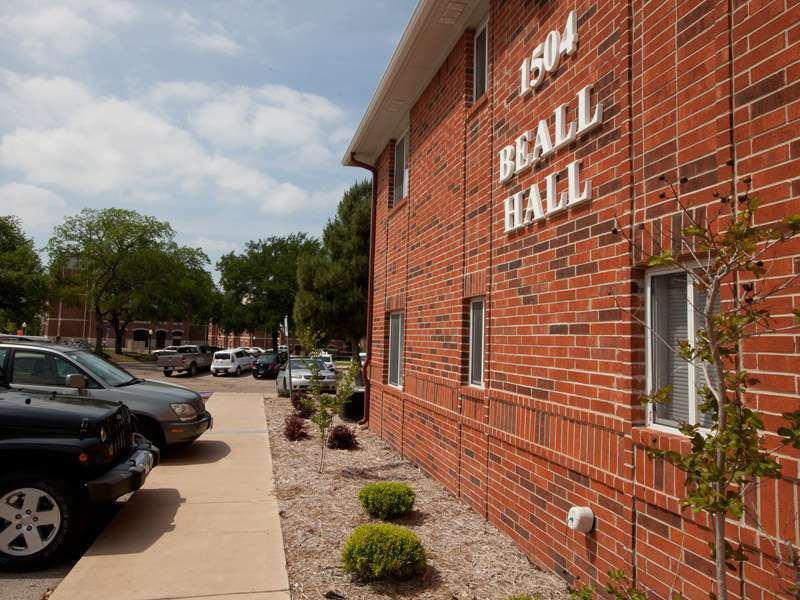 Beall houses a total of 90 residents and is located on the northwest end of the campus, next to Independence Village, a campus apartment-style housing complex, and the intramural fields. It is also within easy walking distance to the dining hall, Mayborn Campus Center, and the academic buildings. The design of the building is unique and features super suite units that the students refer to as "flats". Each of the flats is made up of a living area, kitchenette, dining space, three bedrooms, and three private bathrooms. The bedrooms are assigned as double occupancy. This facility also includes two lobby/TV areas, two computer labs, and two laundry rooms where laundry can be done free of charge. The room measurements are approximate and there is a slight size variation in the three bedrooms in the flat. The standard bedroom size is 13' x 12' (156 sq. ft.). The living/dining area is furnished with a couch, two chairs, an end table, a TV stand, a dining room table, and six chairs. The kitchenette has a set of cabinets, a sink, a built-in microwave, and a full-size refrigerator. Each double occupancy room comes equipped with two twin beds with 80" mattresses, two chest of drawers, and a 8' x 6' shared, walk-in closet. Wireless internet is available in the building and there are two internet jacks per bedroom and one in the living area. Cable and internet service are provided. View the UMHB Channel Guide. Window sizes in the flat vary in the three bedrooms. See the floor plan for window sizes. Mini-blinds are provided. Floors are tile the living area and carpet in the bedrooms. The tile floors are a neutral shade and the carpet in each bedroom is blue. All furnishings are moveable and the beds can be adjusted to create a loft situation for additional storage under the bed.